It’s been a very dreary winter and early spring here in central PA, and I for one am ready for a little color. A couple of years ago, I acquired some space for a dyeing kitchen. I moved in a stove and all of my dyestuffs, and there it has been sitting, unused and unloved, all this time. I have a very good excuse–for three years now, I have been working on a big project, and it is finally nearing completion. Soon I will be able to reveal some details about my project (!) but in the meantime most of my other work, including dyeing, have fallen by the wayside. I am looking forward to being able to spend time exploring and learning again. While searching for a blog topic for today’s post, I came across this old one that I wrote five years ago in July, but for some reason never published. I decided to post it now, if only to enjoy the vibrant colors and dream of summer! 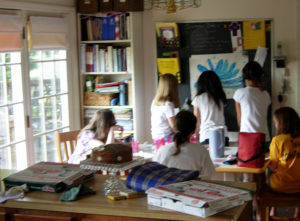 (July 2012) I recently took a break from weaving to host five 11-year-old girls who were joining my daughter to celebrate her birthday. The plan was to eat pizza, watch movies and sleep over (well, maybe more like ‘stay up all night playing something called “flashlight tag”-over’). 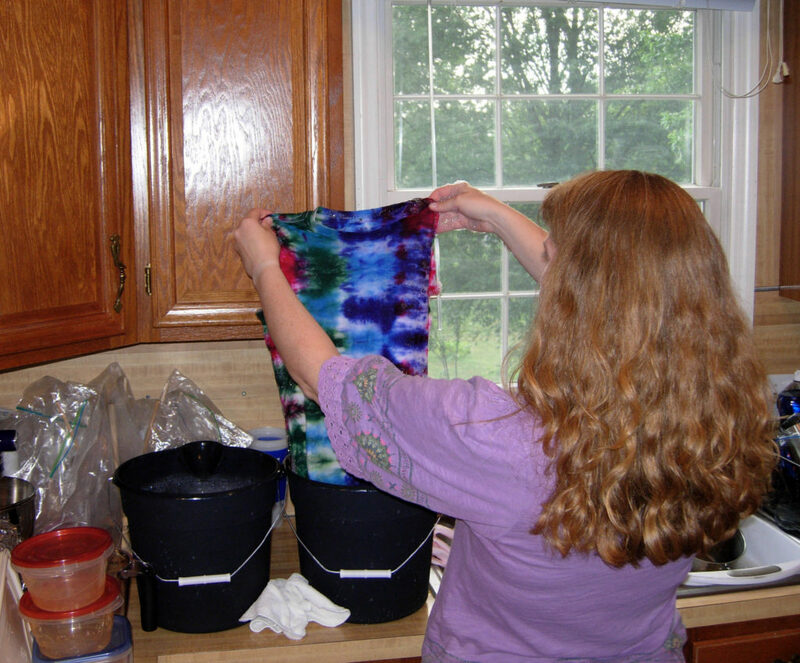 To make all this more fun for Mom, I planned to have a group tie-dye in the backyard using fiber reactive dyes from Dharma Trading Company. 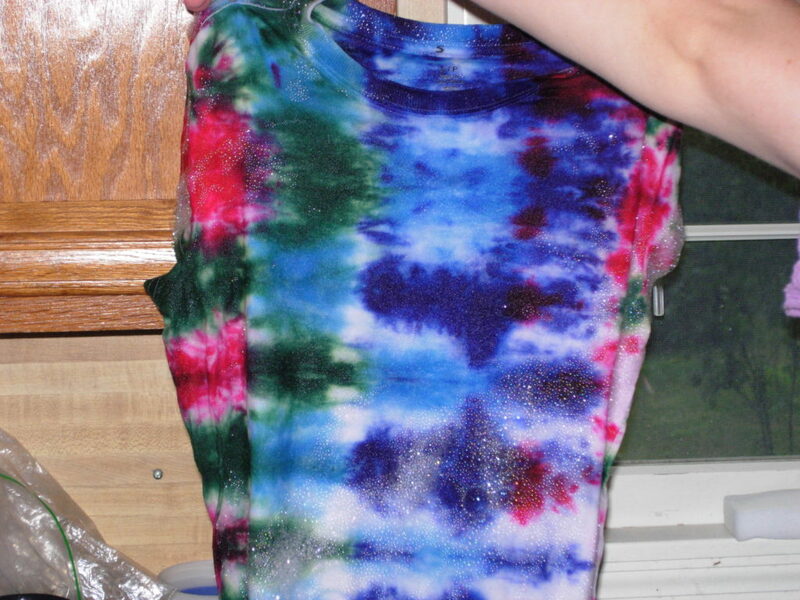 I had used their acid dyes before but never tried to dye plant fibers, and I thought it would be fun for the girls and that they would end up with a much nicer tie-dye shirt than you would ordinarily get from a craft store kit. My daughter finally nailed down a date for the party. For those of you who have kids with summer birthdays, you will know what I mean when I say that this is not easy. Between family visits, vacation trips and summer camps, we have never had much luck getting more than three or four friends together for the big birthday bash. At the end we were looking at very disparate dates—like the 3rd vs. the 26th—something like that. We ended up with July 9th, which was finalized on the 1st or 2nd. 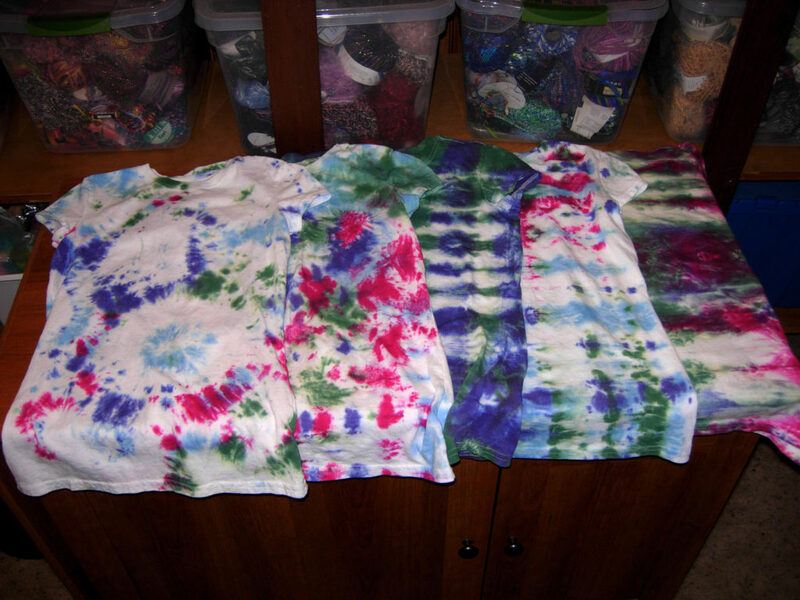 On the 3rd, I sat down with my daughter and we decided on the tie-dye plan. I looked through my dye stuff and decided that I could use some brighter colors. I also didn’t have urea, or the special laundry detergent for processing the finished shirts. I got onto the Dharma site and ordered all that, plus shirts for all the girls, one for my son and one for me (my husband demurred my offer to make him one—he is not the tie-dye type!). I was worried about the order arriving in time so I checked the delivery date—the 9th was the latest expected delivery—and also included a note with my order that if it wasn’t going to be here by the 9th they needed to call me right away so I could decide whether to expedite the shipping or find supplies locally and make do with the dyes I had on hand. To make a long story short, I checked the package tracking on the 8th and discovered that it was due to arrive on the 10th—totally useless at that point—and spent an agonizing 24 hours trying to figure out if I could pick up the box at the UPS hub, where I could buy the supplies I needed if I couldn’t, and how to return the box to Dharma. The good folks at Dharma very kindly called me first thing in their morning on Monday (midday here) and tried their best to get UPS to allow me to pick up the box, but to no avail. However, all was well, as the person I spoke to was able to tell me that I didn’t need the urea, I could handwash in Dawn instead of using special detergent, and she would reroute the box to be returned directly to them without me having to be involved at all (yay!). They credited my account immediately and apologized for their mistake about the shipping date. So I just want to tell anyone who doesn’t already know, that besides having absolutely excellent products, Dharma has amazing customer service. I will definitely be ordering from them again. OMG–There are six 11-year-old girls in my house! Quick, order more pizza! After a quick run to the local big box craft store for t-shirts, rubber bands and squirt bottles, I was ready to go. The girls started arriving at 4:00, but we weren’t going to dye until after dinner when all the girls would have arrived. While the girls finished eating and drew amusing cartoons on my chalkboard, I headed out to prepare the soda ash soaking solution. 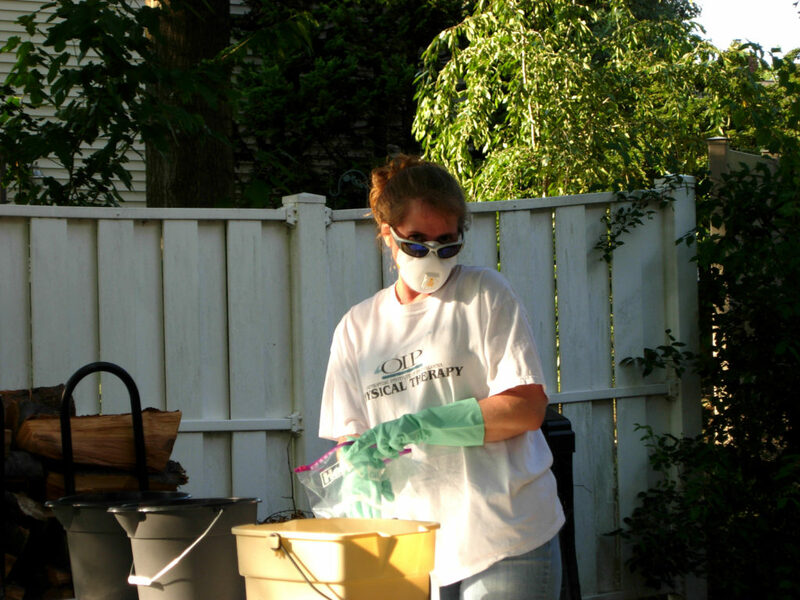 I wore all my super-cool protective gear, since this stuff has a pH over 11. After I had put away the nasty chemicals, I gave the girls their freshly-laundered damp t-shirts and we got started with the tying. My neighbors think I am totally normal. Much thought went into this process. Many opted for the accordion-fold, while a few renegades chose lots of circles. 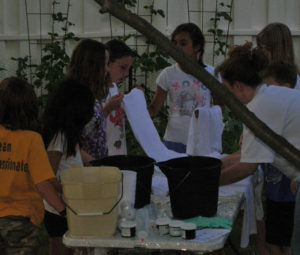 The shirts then went into the soda ash solution to soak for awhile, and the girls took off for the swingset while I prepared the dyes. I used four colors: fuchsia red, yucca (green), lilac and baby blue. Out of what I had on hand, these seemed like the best combination. 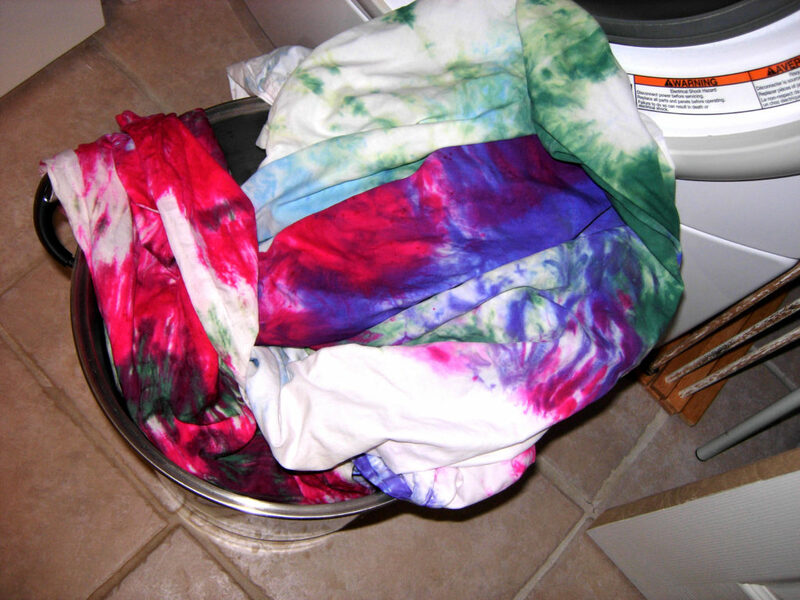 After 24 hours steeping in plastic bags, I unwrapped each shirt, rinsed it and handwashed it in Dawn. As you can see, the colors came out beautifully. They were vivid and distinct, and nowhere did they blend together into brown or fail to appear at all. I plan to tear these up for rag rugs. And now that I have tried out fiber-reactive dyes, I expect to do more with dyeing rags and yarn made from plant fibers. I also learned to not leave your watch on under your gloves during this process…when I put my watch on the next day, I got a nasty chemical burn and rash on my wrist and palm. My mother, the biochemist, who I remember having lots of burn marks on her hands when she came home from work, told me that leather really enhances the chemical burn process on skin. Also, that once you had gotten the chemicals on the leather, it needed to be thrown away. So I was off to get a new watch band the next day. I also discovered some pitting in the metal of the watch itself. I still am not sure how that stuff got under my gloves, but I guess I got off lucky with only a minor burn. It was gone within a day or two, and next time I will double glove and take off my watch and jewelry.